It’s all happening here in Boston! Yesterday the Coolidge Theatre hosted a trilogy screening, in honour of Viggo Mortensen – to whom they are today giving the Coolidge Award. It’s always fabulous to see the Lord of the Rings films on the big screen, and to enjoy them with an army of fellow fans. The 442 seat theatre was sold out – and everyone who secured a ticket was in for a treat indeed! There’s more to come! A full report later in the week will tell you all about the events surrounding this year’s Coolidge Award, including more detail about the fun today. So watch this space! Meanwhile, thanks to the wonderful Coolidge staff – what a long day for them! – and many thanks to all the lovely folks who came up to tell us that they love TheOneRing.net! It’s always a joy to meet like-minded people and to know that you enjoy what we do here. 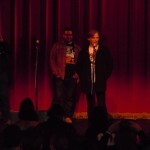 Now I’m off to get my beauty sleep before I go back to the Coolidge for more Viggo-liciousness!